The book published by F/SUW in cooperation with MayFly Books gathers papers based on presentations at the conference Labour of the Multitudes? 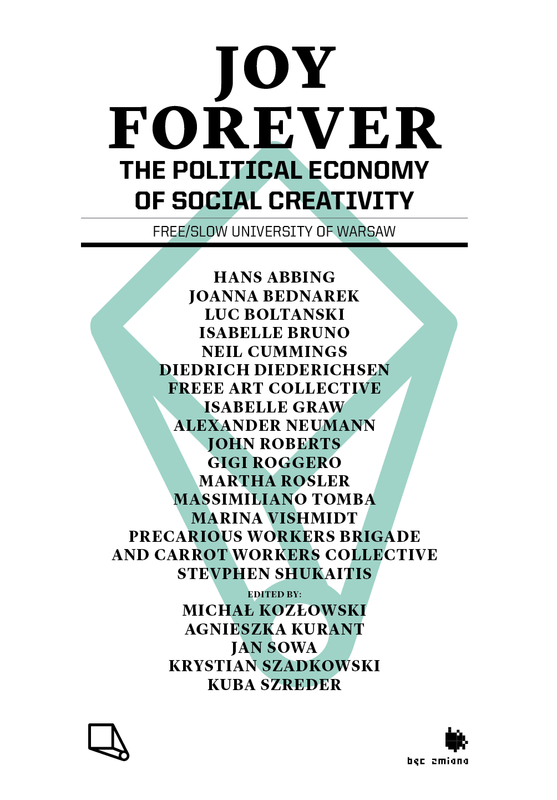 Political Economy of Social Creativity, organized in Warsaw in October 2011. It includes contributions by renowned thinkers and artists, including Luc Boltanski, Neil Cummings, Diedrich Diederichsen, Isabelle Graw, Massimiliano Tomba, Stevphen Shukaitis, and Martha Rosler, among many others. The title Joy Forever refers to the false promise of a common happiness, constantly played out by the proponents of the creative class and creative economy – the very promise that since Romanticism has been ascribed to art itself, a vow which remains unfulfilled. The aim of F/SUW’s publication is to scrutinize the false promises of distributed creativity as an ideology of cognitive capitalism. The authors devote themselves to critical examination of the structural links between art, creativity, labour and the creation of value under contemporary relations of production. Some of them do not stop at a critical diagnosis but go further, reflecting upon potential alternatives to the status quo. The book covers more than the issues of a narrowly understood art world, despite the fact that it pays a lot of attention to them. Art is conceived here as a social lab, where innovative ways of organizing of labour, socializing both for labour and through labour, as well as different types of production, speculation, generation and accumulation and appropriation of value are experimented with and tested.